The tide is turning at the Department of Education. The Obama administration put rules in place to strengthen the rights of student borrowers and make debt repayment easier. But Education Secretary Betsy DeVos has already impeded some of those efforts. What the agency does next regarding student loans affects 40 million Americans who borrowed money from the government to pay for college. "We haven't heard any concrete plans from the administration," said Megan Coval, the managing director of policy and federal relations at the National Association of Student Financial Aid Administrators. "But I think if they completely abandoned some of the Obama initiatives, it would be a real disservice to student loan borrowers," Coval said. Here are some ways the new administration could affect your federal student loan repayment. The Obama administration made it easier for some defaulted borrowers to avoid high fees. Loan collectors had been allowed to charge a collection fee of up to 16% on defaulted borrowers' outstanding balance on loans made before 2010. Obama banned those fees in 2015, for borrowers who started repaying their debt immediately after defaulting. But in March, DeVos overturned the ban. She said the prior administration failed to get input from the public before changing the rule. Her reversal doesn't necessarily mean defaulted borrowers will be charged the hefty fee. 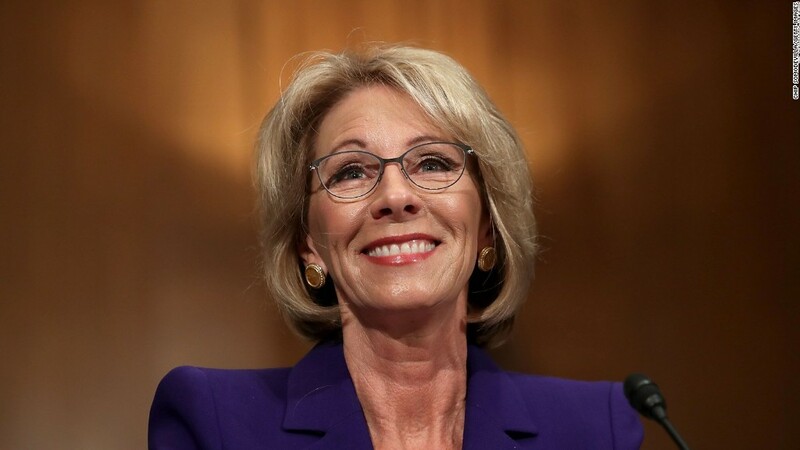 After DeVos weighed in, a group representing student loan servicers reassured borrowers that they would not start charging these fees again regardless of the new directive from the Department of Education. If you borrowed money for college, you probably have more than one federal student loan. And each loan might be managed by a different loan servicer, making it hard to keep track of how much you owe. The Obama administration wanted to simplify the process by creating one place to repay all your loans. It started to roll out details of a single platform system and allow loan servicers to bid for contracts last year. But DeVos halted the process. "Unfortunately, this process has been subjected to a myriad of moving deadlines, changing requirements and a lack of consistent objectives," wrote DeVos in a memo on April 11. She did not include an alternative proposal. But she did say that the department should increase "accountability and transparency for all borrowers, while also limiting the cost to taxpayers." A trade group representing student loan servicers has criticized the bidding process and called on lawmakers to review whether moving to a single platform would benefit borrowers. But student borrower advocates had applauded the single platform system. "This was a pretty common sense solution that wasn't particularly controversial. To see it go without context for what the department plans to do does cause a little bit of concern," Coval said. During his campaign, President Trump pledged to change the federal government's income-driven repayment plan. The plan aims to help struggling student loan borrowers to make their payments by capping them at a certain percentage of income. Trump said he would change the terms of the program so that payments would be capped at 12.5% of income and any remaining debt would be forgiven after 15 years. Under Obama, the program caps payments at 10% of discretionary income and forgives outstanding undergraduate debt after 20 years. DeVos hasn't said whether she would support the change. The Department of Education did not return requests for comment on this issue. The Obama plan remains available to borrowers. Student loan borrowers who applied for the public service loan forgiveness program will be closely watching how DeVos responds to an ongoing lawsuit about who qualifies for loan cancellation. The program forgives remaining debt after a decade of on-time payments for borrowers who work for qualifying employers, which include the government, 501(c)(3) organizations and some other kinds of nonprofits. But the lawsuit, filed in December by four lawyers who worked for nonprofits, has called into question who qualifies for the program. The plaintiffs claim they were initially told by their loan servicers that their jobs would qualify them for the forgiveness program, but that the Department of Education later said they did not. In a court filing submitted in March, lawyers for the department suggested that some borrowers may not be able to rely on prior notices about whether they qualify. They said that notice from a loan servicer does not confirm the department's final decision. Congress enacted the public service loan forgiveness program in 2007. The first eligible group of borrowers expect to see their debt wiped away starting this fall. CNNMoney wants to hear from people who applied for the public service loan forgiveness program. Email Katie.Lobosco@cnn.com to share your story.